As much as journalists like to think the world revolves around them, a significant part of IFA 2010 isn't the many press announcements, but when the doors open to dealers, buyers and the general public. The press may contribute to promoting the products but IFA is all about selling stock and to shift product you need to impress way before the final handshake. First impressions are vitally important, so this is why the way a company's booth looks is almost as important as the products on show. Like performing peacocks, each booth tries to outsmart the other and one of the best on show this year was Sharp and its video wall. 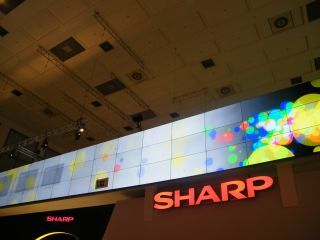 Comprising 54, 60-inch PN-V601 TV panels the wall was a dazzling display of TV technology. The wall was three panels in width and 18 panels across and between each TV was a mere 6.5mm of room. While 6.5mm is a tiny amount of thickness, this could be theoretically be reduced due to the complete lack of frame on the panels, but the reason it is there is to act as a cooling duct. No breathing space means overheating panels and a real possibility the set-up would end up being a huge but useless glass structure. If you add all the space between the panels together the is just 4cm gap in the whole setup. To hold the panels in place, it's not just some screws and sticky backed plastic but massive powerful magnets which make sure the whole structure stays exactly upright. When it comes to showing content on the video wall, it is not simply the case of spinning a Blu-ray and connecting a BD player to the fist panel by HDMI, there is a complicated system of computers which make sure that each TV plays the right part of an image in time with the rest of the wall. Alongside the calibration software, the image is piped through using DVI (working in three TV block clusters) and each monitor block is then given its own IP address and ethernet connection so if there is any lag, it can be logged and fixed instantly. The size of the setup was breathtaking and so was the weight of the thing. Each panel weighed in at 45kg and the whole thing clocked in at six tonnes. Surprisingly the whole thing took just two days to put together. This is mainly due to the size of the panels. The bigger the panels, the less you have to piece together. Sharp's 13ft x 7ft video wall will take some beating for sheer spectacle but considering Toshiba, Samsung and Sony had similar and just as impressive setups it just goes to show how much effort and planning is put into making IFA what it is. Bring on the wall, indeed.